Series RAC » Unitrack Industries, Inc. 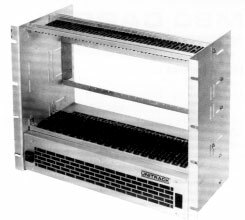 The combination of both card cage and cooling package provides the advantage of a single-purchase unit using the standard size Unitrack p.c. 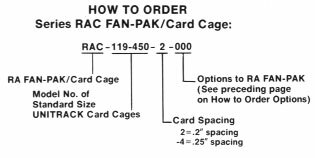 card cages with built-in RA FAN-PAK. The combined unit, Series RAC, can be designed as a complete component ready to mount in standard 19″ cabinetry. 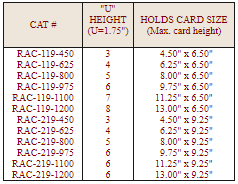 You can take advantage of the versatility of Unitrack cages which allow card frequencies on .2, .25, .5 or .75 centers and Unitrack card guides which assemble by either push-in rivets or snap-in buttons. The patented Unitrack vibration damping card guide, which holds the p.c. board between viscoelastic fingers and allows air to flow through the guide, is ideal for this application. 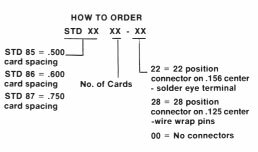 STD 85 Card Files are furnished with either UNITRACK or S300 Series Card Guides. S300 guides are normally furnished. 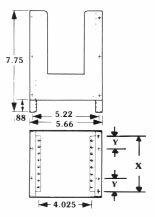 If UNITRACK guides are desired please specify when ordering. This low cost, sturdy cage packages 4 1/2″ x 6 1/2″ STD BUS cages compactly. 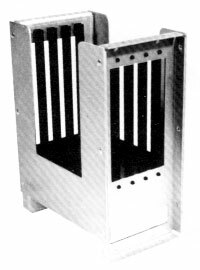 STD cages are assembled units with card guides mounted in place. material is gold irridited aluminum, 22 or 28 position connectors. 22 or 28 position connector gold plated contacts.